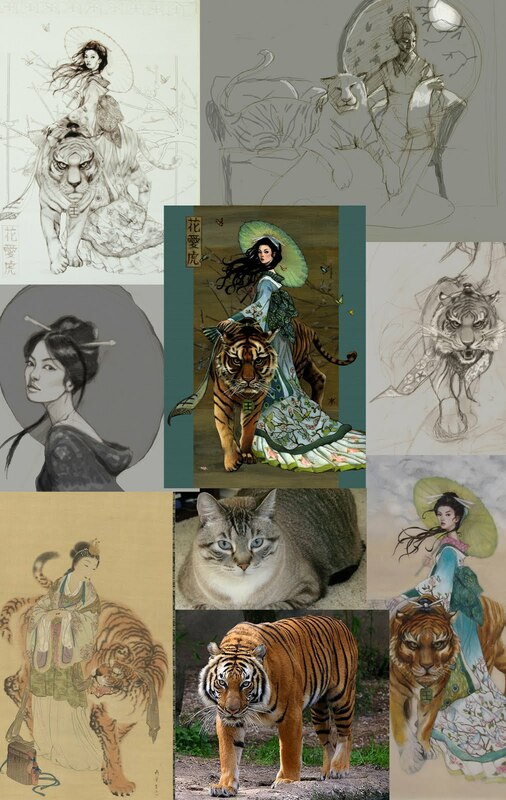 Here are just a few of the sketches, photo references, revisions, etc. of my IMC 2010 assignment for Beauty and the Beast. So, have you ever had a painting that you just can't get the way you are seeing it in your mind's eye? I know, most of my stuff falls into that "something's lacking" category. Well, some have more lacking than others and Beauty and the Beast has had more than it's share of revisions in it's quest to measure up to my vision. In preparing something for my Spectrum entry, I have revisited B & B, yet again and am now on my 7th version...or something close to that. Here's BB#7. This is much closer to my original idea of the Japanese vertical silk painting. Paint goes on tonight. Watercolor. And yes, I know he doesn't have any eyes...I'm painting those in...as well as the stripes. Ooooohhhhh! I'm looking forward to seeing this in Spectrum! I think you IMC version was beautiful but I am excited to see this done in watercolor. It looks gorgeous so far. I have never, ever felt that your work is lacking. Not ever. It is always beautiful and imaginative and full of life. I love it. I always feel inspired when I visit your blog. And honestly I love every single version you've done of this so I'll be looking forward to the new one. 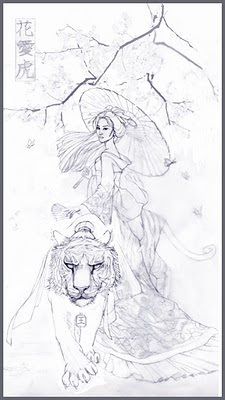 But I have to say that the sketch at the top of Beauty sitting next to Beast is one of my favorites. :) Also I just heard that The Monstrumoligist won the Printz award, so now I must read it. Creepiness and all! Rose: a mural would probably land me in the loony bin. Where are you doing this? Christina: LOL! Can you imagine the competition level this year? Hey, a personal goal, okay. No expectations. You entering too?? That kitty must be entered! Crystal: Thank you for all your kind encouragement. Let me know what you think of the book. I read the second one. In many ways, it's even creepier. Oh my, isn't that the hardest thing, setting down on paper what you see in your minds sye. Kim your waork is the last i should say was lacking though. Each & every version has a something to it. Good luck with trying to capture the essence. Hi Kim, I love seeing how you piece together your ideas with reference images and sketches, to eventually putting together the final art. Thanks so much for showing this, as I am an aspiring artist, and it's great to see how you put it together. I have gathered reference images, and done a couple of sketches, only to struggle and not know how to put it all together. Thank you for showing me I am not the only one that worries about that! I hope to find the courage to piece it all together, enabling me to create beautiful and original art. Thank you ruthie and SketchingGirl. SG, I visited your blog and I think you have some very realistic goals set for yourself. Good luck!